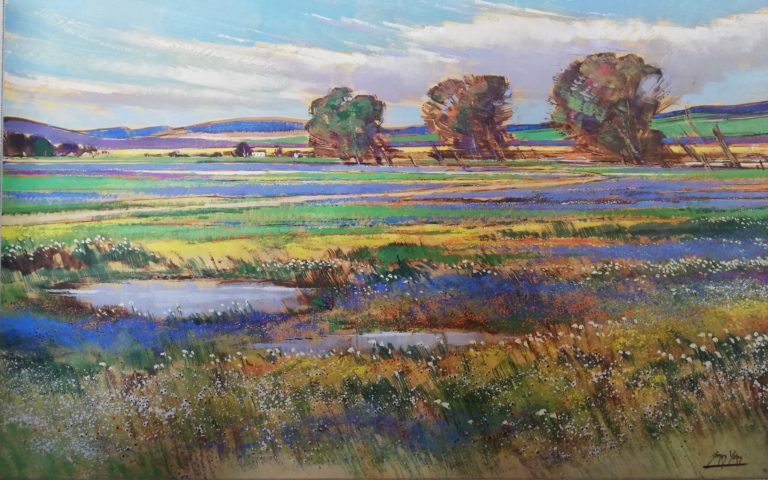 James Yates was born in Johannesburg in 1944, but grew up in the Cape His talent was first observed at the age of two when he was found drawing in the sand. Given a set of paints for his 10th birthday he sold his first work at eleven and soon had a list of patrons wanting an example of his work. At the age of thirteen he was featured by the Cape Argus newspaper under the heading “13 year old school boy is successful artist” (see pic right). A six month overland tour of Africa, Europe, Scandinavia and Britain interrupted his fifteenth year. James was so impressed by the changing scene that he couldn’t resist working even when the motorized home was in motion!! James completed his education at St Aidan’s College, Grahamstown. He did his national service in 1964 and, never thinking he could make a living from his first love, he started a printing apprenticeship and became a Sunday painter. After three years of printing he could no longer resist his vocation and towards the end of 1966 he took the plunge of which all amateurs dream. Under the guidance of one of South Africa’s greatest photographers, Arthur English, he mounted his first one man show. This was followed shortly by a “milestone year” in 1970 when the Readers Digest purchased three major works and reproduced them as prints. BP and Shell soon followed suit thus the young artist busy career was launched. James’s father was born in Chesterfield, England though to cement his link to the UK in 2001, his son Bevan met and subsequently married a Lincolnshire lass. This led to many visits to the county where his artistic eye was soon inspired by the different sights, colours, textures and seasons found in the beautiful English countryside. It is “completely different to back home in Cape Town” said James “maybe I have some genetic memory of this” he continued, thus his Lincolnshire based collection began. James paints in oil on canvas to create not only his own collections but also on commission, so please contact him if you would like to own his unique impression of your special scene or place, just ask for details.